The season of vicarious wanderlust on True Stories Well Told rolls on through end of June. Not far from Cake, Alaska, we woke up at 4am to the sound of a dozen eagles yelling at each other as they scrambled for long unseen delicacies. Eagles don’t tend to be social birds, and it is a rare joy to find more than a mated pair together, but that morning, as far as possible from the community of Cake and still being on the same island, they were flocking. And rather than it being a joy, I just wished they would shut up and let me sleep – which hard enough with the bright light of day shining through the tent walls. At this hour. However, it was a spring tide, when the moon and sun are exerting maximum pulls on the oceans and the waterline, therefore, was super low. Rocks that aren’t normally exposed, are, and the eagles were happy to have a chance at the muscles and tidbits in the puddles and tide pools. Normally, Scott and I would have been out there with his long-lensed cameras, peering at the scavenging birds through a hasty blind of convenient ferns, but today, we could barely roll over and complain. Summer nights in Alaska are, above all, short, and the previous day included lots of sea kayaking in the strange to us currents and winds of Frederick Sound. My arms ached, and I was definitely not ready to roll out of the sleeping bag yet. But there was sunlight diffusing through the tent walls. That too was a rare thing. A local lady at a national park headquarters had told us “You know what we do in Alaska when it rains? The same thing we’d do if it wasn’t raining. Cause otherwise, we would never do anything.” She was on the way to watch her son’s little league game, while we’d been wimpy drowned rats. So it’s early, it’s bright, we can’t sleep through the breakfast of our nearest neighbors, and it’s going to be a gorgeous morning. “We could lounge around in the tent all day.” I said. “No you couldn’t. You’ll get antsy and decide to start cleaning gear or something.” Scott replied. Cursing the Midwestern work ethic, we made breakfast and did camp chores while the eagles finished their dessert and flew off. The tandem kayak on the beach needed a little outfitting, and the camera gear tucked safely in its clever transparent dry bag case – you can work most of the controls and the huge lensed SLR stays safe from the corrosive salt water. A few trawlers passed a couple miles out in the sound but clearly visible from our shoreline camp. As were a handful of tall black fins to the south. After a flurry of paddles and neoprene, we were afloat and heading straight towards the trawlers who were beginning to play out their salmon nets. If the salmon schools were out here, that explained the orcas. A naturalist once told me that to an orca, salmon was the equivalent of chocolate, a treat for the blackfish. There’s a couple other things I’d learned about orcas from her: first, that it is illegal for any boat to approach the whales, but not illegal for a whale to approach a boat. And second, that the whales have a tendency to surface to breathe three times before diving deep. So there we are, bobbing in the waves in a thin fiberglass hull, paddles resting on our laps watching killer whales approaching from the south. One spouts and slides under the water, then shortly reappears & blows about a quarter mile off or port, and descends, and then does a final appearance and breath and disappears into the deeps. You can line up the three points and have a good guess as to where the whale is heading, so we turn the kayak to paddle that direction, really hard. When she comes up to breath with a soft boom, we drop our paddles and drift. It’s up to her how close she wants to get to us, and it appears that several hundred yards work fine for her. Three blows, and down. The rest of her pod is scattered east of us in the sound, more or less on the same rhythm. We sprint while the sea is clear of fins, and rest and enjoy spotting them as they surface. And then Scott makes a sound of dread. We have a rule around salt water: the big, expensive camera does not for any reason come out of the dry bag. “I have a clean lens cloth sealed in this bag,” he says. “I’ll steady the boat,” I offer, and he sets his paddle down, takes off his neoprene gloves and starts carefully opening watertight seals and cleaning lenses. Being in the bow of the tandem, I couldn’t turn to watch him, so I counterweighted when he shifted and watched a young male surface and blow a football field away. A little bit later, the tall black fin slice through the water only 50 yards away. He’s heading in our general direction. 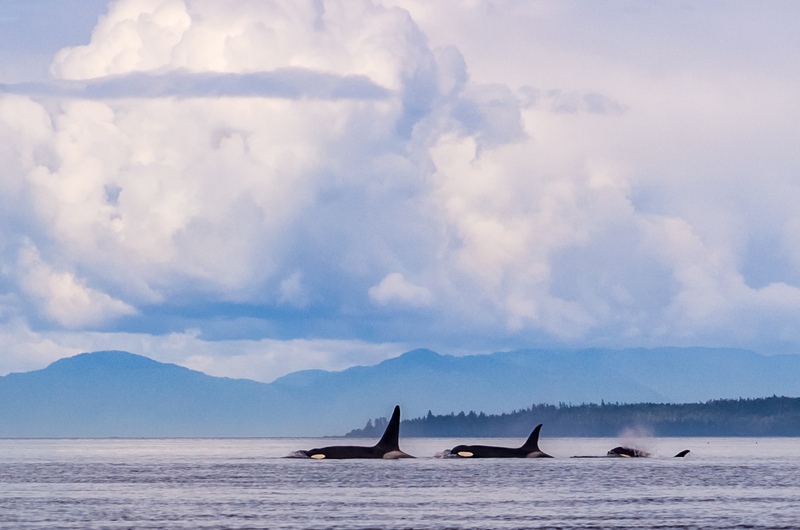 Orcas, from nose to tail, tend to be about 20 feet long, which is about the size of our craft. “Almost there,” Scott says behind me. First: The orca is breaching right in front of me and is going to smash this tiny boat. Second: Whew, that is not a whale, it’s a salmon. Third: WHAT JUST CHASED IT OUT OF THE WATER? At this point, Scott says “Alright I’m set,” and looks up. I can barely breath. There was no third blow; the whale kept right on swimming. We continued to parallel the pod, but at the tip of the next island to the north, we noticed a whale watching cruise was anchored. We had the orcas with us, though they were edging ahead and aiming for the east channel. Everyone on the cruise ship was looking west. There were humpbacks here, and they were bubble netting. Since orcas have been known to make a meal out of their humpy cousins, we were at this point happy to watch them swim off to the east. And we were happy to sidle up next to a private fishing boat, since the humpies are about 45 feet long, and we were feeling particularly small and fragile. As we watched, a large crescent of bubbles, then a circle of them, appeared in the smooth waters. Shortly after, a humongous head boiled up through the middle, straining out the water and swallowing all the krill, be fore flopping back down into the sea to digest and then take a turn at blowing the net for its kin. We realized how lucky we were to have caught this act. And then we realized that we were miles from camp and extremely tired. And sore, don’t forget sore! We soon limped with the tide back to our beach. But the day had held a rare treat of underwater surprises. © 2014. Rita Nygren is a database miner and risk-averse adrenaline junkie living in Oregon when not traveling to interesting wilderness locations. This entry was posted in Guest writer and tagged alaska, travel. Bookmark the permalink.